INDONESIA — U19 Việt Nam beat U19 Philippines at the ASEAN Football Federation (AFF) Youth Championship yesterday. Head coach Hoàng Anh Tuấn’s team found it easy to control the match and launched a wave of attacks on the rival’s net. In the first round, after many failed shoots by Minh Bình and Xuân Tú, and a yellow card dealt to Bình due to a goal area fault, Lê Văn Nam had an exact header and scored 1-0 for Việt Nam after 29 minutes. In the second stanza, U19 Việt Nam played more passionately as Nam scored again after receiving a pass from Tú. Bình then scored again nine minutes later, opening the score to 3-0. Twelve minutes later, captain Hồng Sơn contributed a goal for Việt Nam, raising the score to 4-0. 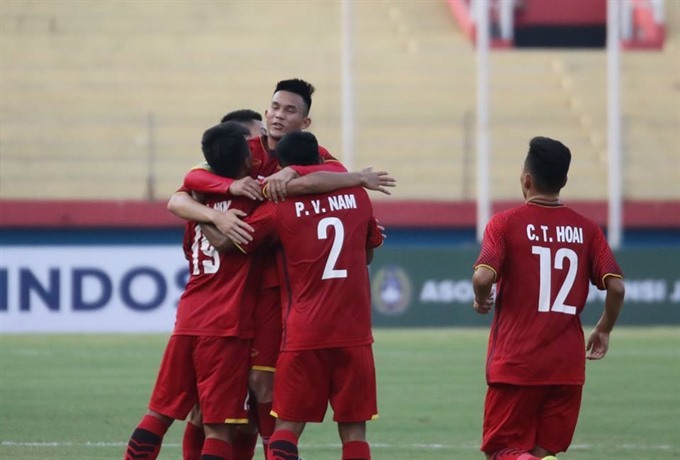 At 85 minutes, when the Philippines showed sign of exhaustion, U19 Việt Nam retained their stability and Duy Kiên finished the match with the last goal, sealing a 5-0 victory for Việt Nam. With this victory, U19 Việt Nam headed to the top of group A.